Need a helping hand to lift heavy objects around the house or yard? 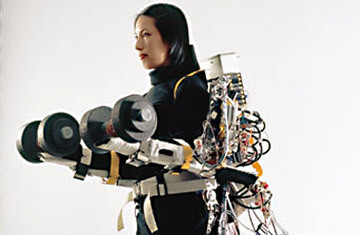 The Power Assist Suit, developed by a professor at the Kanagawa Institute of Technology in Japan, is a computer-controlled system that uses air pressure to augment your strength. In tests, a 100-lb. woman wearing one was able to lift a 150-lb. man. As you bend your arms and legs to start lifting, sensors on the suit detect which muscles are being used and activate a battery-powered air pump, which in turn inflates a series of air bags on the suit. As the bags inflate, they provide added support for your back, arms and legs.